The stock market essentially deals in two kinds of asset; shares and bonds. These investments have very different characteristics; shares make you a part-owner whilst bonds, being debt instruments, turn you into a lender. They say shares are for optimists, bonds are for pessimists. I have become a little less optimistic on equities over the past year which is why I have reduced the mix to 50:50 (from 60:40 previously). Similar to my other holding in this sector, City Merchants investment objective is to seek to obtain both high income and capital growth from investment, predominantly in fixed-interest securities. It is almost three years since I purchased this IT for my ISA as a replacement for a few sales from my shares portfolio. They have this week announced results for the 12 months to 31st December 2017 (link via Investegate). Net assets have steadily increased over the year and taking the full year dividend of 10p per share into account, the total return was 9.9% (2016 11.6%). Over the past 5 years, the return has been 49.7%. The dividend target for the trust is 10p per share paid quarterly. This amount was paid in each of the previous four years and remains the target for the coming 12 months. At the current price of 177p the shares offer a yield of 5.6% which is obviously attractive compared to the rates on offer from our banks and building societies. The average cash ISA rates are starting to increase but only offer a miserly 1.2% according to latest figures from Moneyfacts. In 2007, the average rate was 5.0%. Of course, the share price will move around as can be seen from the chart. In recent weeks there has been some weakness and the share price has moved from a 2% premium to an 6% discount which has resulted in the yield becoming more attractive. 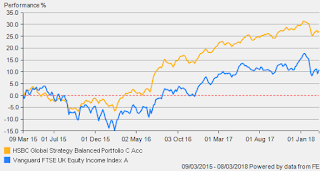 Regardless of the share price fluctuation, the trust provides some diversity to equities and a steady and predictable quarterly income stream for my portfolio. It is now 3 years on since my initial purchase of this UK income index fund. 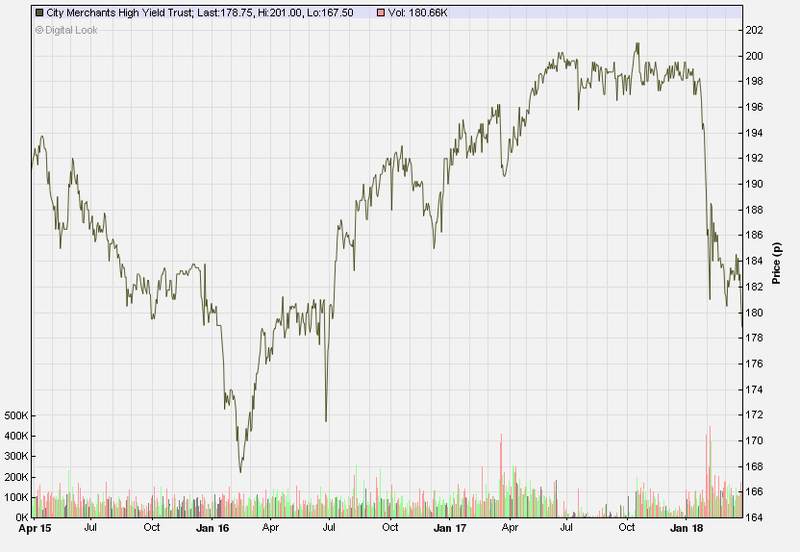 The Vanguard fund tracks the FTSE UK Equity Income Index. 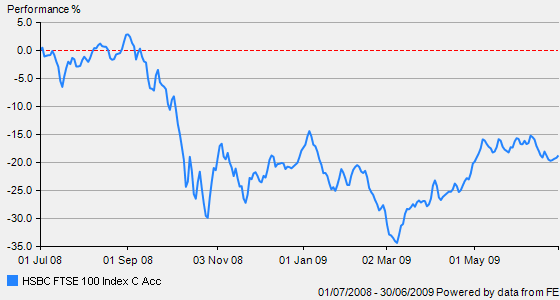 The concept is fairly simple - to give investors access to a broad range of dividend-paying securities from across the FTSE 350, while reducing the risk of being overly invested in a small number of high-yielding shares or particular industry sectors by limiting the percentage of the index invested in any one company or industry. The Vanguard fund holds around 120 companies - the top ten holdings include all the usual suspects - Vodafone, Glaxo, Lloyd Bank, BP, BATS, National Grid etc. My initial purchase price in May 2015 was £177.50 - by last March it had risen to £181. However, it has retreated over the past couple of months and is back to just below my entry price, currently £174 and a total return of just 1.0% over the past year (incl. income). City of London 2.2%, Edinburgh -7.1%, Finsbury Growth & Income 10.6% and Temple Bar 2.5% (average 2.0%). At the start of the year I took the opportunity to sell off part of my Vanguard holding as I am looking to reduce my UK equities and moving down the risk scale with more globally diverse multi-asset funds being introduced to my portfolio. 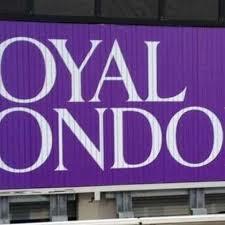 I have invested the proceeds between HSBC GlobalStrategy Balanced and Royal London Sustainable Growth fund. The fund has so far provided me with income payments of 776.92p in 2015, 775.65p in 2016 and a nice 10% increase to 857.87p in the past year - which gives a current yield of 4.8%. However, the income was inflated by the weak level of sterling in 2017 so I am expecting a reduction this coming year. Dividends are paid out half yearly in June and December. The income distribution represents the combined dividends received from all holdings in the fund (less costs and fund charges) so, unlike investment trusts which hold reserves to smooth out the income payments, I do not know exactly what payment will be received in my ISA until it actually arrives. It’s early days - just three years since purchase but I am happy to continue with the remaining holding of this income fund which seems to be doing the job required for my income portfolio. As ever, this article is a record of my personal investment thoughts/decisions and is not a recommendation - as always, please DYOR. This commercial property REIT was added to my income portfolio in October 2016 following a placing of shares at 132p. Tritax Big Box is the only Real Estate Investment Trust dedicated to investing in and funding the pre-let development of very large logistics facilities in the UK. The company believes these properties, known as Big Boxes, are one of the most exciting and highest-performing asset classes in the UK real estate market. BBox have sought to distinguish themselves through the quality of location and modernity of their real estate assets let to high calibre tenants, which provide long term income and attractive prospects for growth. Tritax Big Box was first listed at the end of 2013 at an initial floatation price of 100p. During 2016 it raised £550m of equity through two substantially oversubscribed share issues. In May it raised a further £350m which was invested over the rest of 2017 and brings the market cap to £2bn. They have today issued results for the 12 months to end December 2017 (pdf via website). Total Shareholder return for the period was 15.2%. The company target a total return (being the increase in EPRA NAV + dividends paid) of 9.0% per year - the figure for 2016 was 9.6%. Profits came in at £247m (2016 £92m) and total portfolio assets are valued at £2.6bn across 46 assets (2016 £1.9bn across 35 assets). Building on payouts for the previous three years of 4.15p in 2014 and 6.0p in 2015 and then 6.2p, the declared dividend for the full year 2017 is 6.40p rising to 6.70p in the coming year. At the current share price this provides a fwd yield of ~4.7%. The company have now moved to quarterly dividend payments. The Group's dividends are not quite covered by adjusted earnings of 6.37p, which are underpinned by strong rental stream and low cost base. “We have a sector-leading portfolio of UK Big Box assets that are benefiting from structural change driven by increasing e-commerce penetration, and the operational and financial benefits which they can provide to our Customers. The fundamentals of our market remain positive and are largely unaffected by current geopolitical and economic uncertainties. Despite the uncertainties it brings, Brexit may provide a silver lining, since with increased border controls our Customers will require more warehousing domestically, further supporting our business case". I like what I have seen so far and I believe the model offered by Big Box which is basically tapping into a part of the online revolution, has potential for growth as well as a fairly secure dividend underpinned by the long leases and upward-only rent reviews. The share price has gained 8% compared to my purchase price of 132p. In addition, I have received a dividend of 6.4p and the prospect of an additional 4.7% increase to 6.7p for the coming year. The way we shop has changed quite significantly over the past decade and internet sales are forecast to account for over 20% of total sales by 2020. 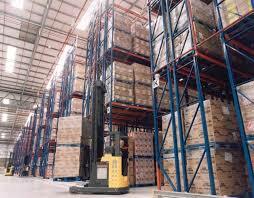 To remain competitive in this environment, retailers need to have large, highly efficient distribution facilities that can fulfil orders quickly and accurately. This need is only becoming more acute as customers demand ever-shorter delivery times. The demand for the BIG boxes offered by this REIT is likely to remain strong which means the dividend is reasonably secure and should easily keep pace with inflation. This is an update of an article first published in 2013 and forms part of my 'basics' investing series. I guess most investors will have read somewhere that its generally good to hold a diversified portfolio. 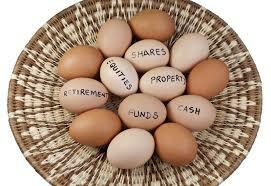 As with many aspects of life, it's not generally a good idea to put all your eggs in one basket. 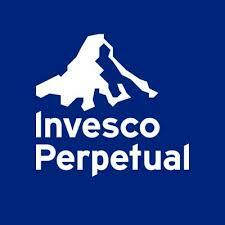 Therefore, investing in a broad mix of assets such as equities, bonds, property etc. in many regions around the world will protect investors from a downturn in any single sector or region and also reduce the volatility associated with an over-reliance on for example equities or emerging markets. The aim will be to create a mix which can provide an acceptable level of return for the degree of associated risk undertaken. Novel Investor (US-based) has created a nice asset quilt visual chart which clearly shows the returns for several types of asset over a 15 year period. I hope it will demonstrate how difficult it would be to select the best performing asset class year after year and why the better strategy is to hold a good mix of all assets. Creating a simple yet diverse portfolio can be very straight forward. Pooled investment vehicles like investment trusts, exchange traded funds and OEICS are a good way for the small investor to build a diversified portfolio. Indeed with the broadly diversified Vanguard LifeStrategy fund you have the option of a one-stop investment vehicle providing all the diversity and balance that may be required. So, in one single multi-asset fund there are 16 sub-funds which between them hold around 18,000 individual securities from all corners of the world. 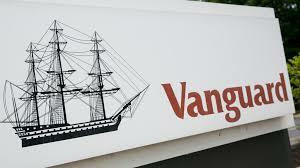 Vanguard frequently rebalance the funds to maintain the equity proportion at 60%. 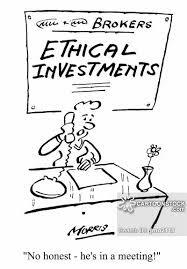 For running such a fund they charge the investor 0.22% which works out at £2.20 per year for every £1,000 invested. Investing does not come much more diversified. Since its launch in June 2011, the fund has provided an average annualised return for investors of 9.0% per year which would certainly be 'good enough' for me. It's all about the balance between risk and reward. Some assets such as equities will provide a better return than bonds over the long term. However, they are more volatile than bonds. 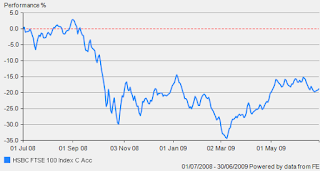 For example, during the economic meldown of global markets in 2008, the FTSE lost over 30% in a matter of just two short months. The following year it was up 30%...this was a very testing time for anyone purely invested in equities and many investors were emotionally unprepared for the rollercoaster ride. For those who held a more balanced mixed portfolio of say 50% eqities/bonds, the most they would be down in 2008 was nearer to 12% with a corresponding rise of 16% in 2009...still a little volatile compared to previous years but much less of a stomach-churning ride of the 100% equities and I believe most investors would be much less unnerved during a severe downturn. Here's a link to Vanguard's asset mixer tool which provides a useful visual graph of the annual rise and fall of various allocations of equities/bonds/cash over any designated timeframe. It can be very useful for those wanting to explore asset allocation and their individual risk profile. In addition to my Lifestrategy funds, I hold several investment trusts - some from the UK growth & income sector such as City of London and Finsbury Growth & Income, some for global growth such as Scottish Mortgage as well as others focussed on infrastructure and fixed income and for exposure to UK smaller companies I hold Aberforth. Personally, I would never place all my investments with one fund or even several funds with just one provider. 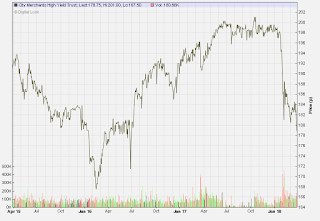 I like to spread the risk - some index funds, some professionally managed investment trusts. I like exposure to different sectors of the economy and prefer global rather than confining my investments to the UK-listed investments . However, some would argue it is possible to be over-diversified. Legendary investor Warren Buffett suggests that if you diversify too much you might not lose much but equally, you won’t gain much either. His approach is to concentrate on companies he knows inside out and select a few well researched options out of which there is the expectation of some big ‘winners’. As can be seen in the chart, the benefits of diversifying a portfolio tail off as more investments are added to the mix. Buffett is exceptionally experienced, skilled and disciplined in his approach to investing - many try to emulate his success but no one has come close. A return of just under 20% cagr over the past half century is a phenomenal achievement. For the average small investor therefore, I would think the better strategy would be to focus on a good mix of assets which should closely match your temperament and appetite for risk. 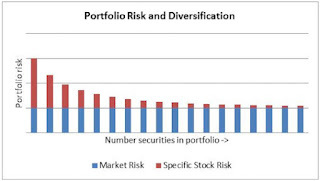 The diversified and balanced portfolio will always miss out on the very best possible returns but equally will avoid the terrible car crash whist delivering what should hopefully be acceptable and a 'good enough' return. Feel free to comment below on how you go about maintaining a diverse portfolio.